There it came, the announcement for GT40 – the farewell tour! Accompanied by a new album. 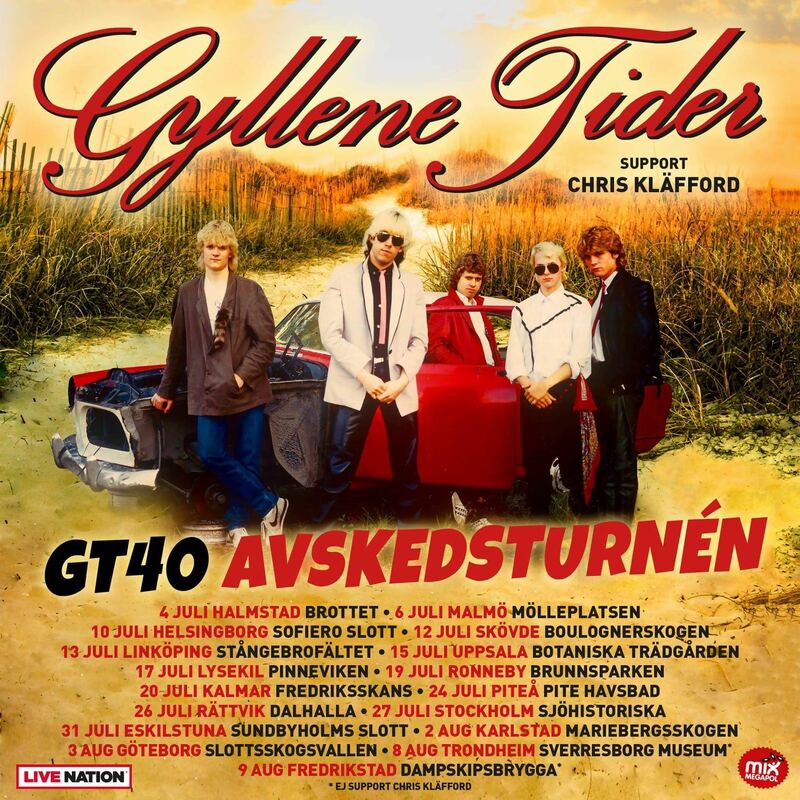 After 40 years, Gyllene Tider says goodbye with a great farewell tour and a new album. In the summer of 1978, all Swedish record companies are bombarded with demo cassettes post-stamped in Halmstad, containing songs such as “En konstig tjej,” “Rembrandt”, “Mona Lisa”, “Billy” and “När alla vännerna gått hem“ by a hopeful new band that calls themselves Gyllene Tider. All companies send more or less polite refusal letters back to the 19-year-old songwriter Per Gessle, who then realizes that if the band ever will get to release a record, they must do it on their own. 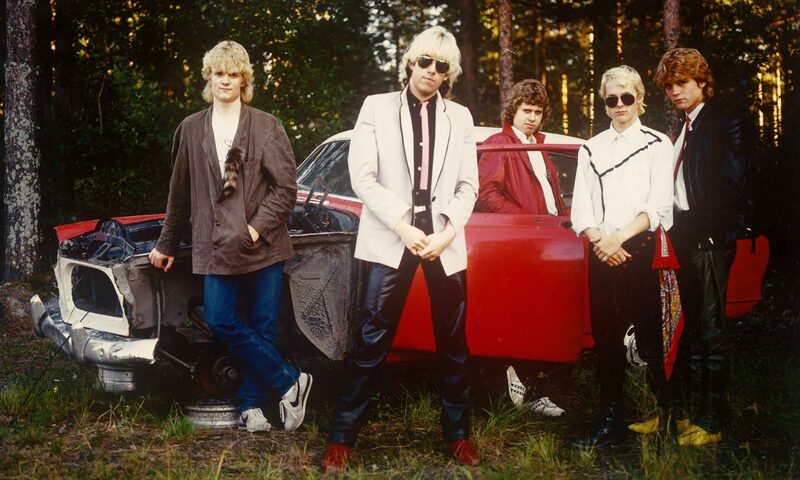 The tactic succeeds and in the spring of 1979 Gessle, Mats “MP” Persson, Göran Fritzon, Anders Herrlin and Micke Syd Andersson receive the record contract which via the hit single “The Girls on TV2” is to make Gyllene Tider an institution. What follows is an almost endless cavalcade of hits: “När vi två blir en“ spend sixteen weeks on Topplistan’s first place over Christmas and New Year 1980-81, “Sommartider” makes 1982 the band the official supplier of the soundtrack to the Swedish summer – and then we have not even mentioned songs such as “(Kom så ska vi) Leva livet“, “Ljudet av ett annat hjärta”, “Tylö sun”, “Flickan i en Cole Porter-sång”, “Det är över nu!“, ” Juni, juli, augusti”,” Kung av sand” and especially “Gå & fiska!”. Four decades, four million sold records and several record tours later, Gyllene Tider can look back on a career that has always entered the group in Swedish pop history. Often they have only been able to compare themselves to themselves – for example, the “Återtåget” tour in 1996 broke all the records with 300,000 visitors, just to be poked down to the second place when the group celebrated its 25th anniversary before an audience of nearly one and a half million delirious fans. Also “Dags att tänka på refrängen” tour in 2013 got into the record list – of the four largest tours in Sweden through the ages, the Gyllene Tider holds place one, two and four. Per Gessle: 40 years is a long time and it is absolutely fantastic that we as a band and our music have managed to touch several generations of Scandinavians. I am fortunate to have been playing with Sweden’s best pop band. Anders, Micke’s, Göran’s and MP’s expertise has given me endless opportunities to write power-pop just the way I longed for as a teenager. Gyllene Tider’s farewell tour includes 17 concerts premiered at home in Halmstad on July 4th. Anders Herrlin: I think it’s a perfect opportunity to end now. Everyone in the band is still active musicians and is in many ways better than ever. All of that we can bring into the new album and the summer tour – and say thank you with the flag still high. Micke Syd Andersson: This tour feels like our thanks to the amazing audience we have had a love story with for so many years. It will feel like a single long birthday party you share with friends and family – the final of an incredible journey you can only be grateful for having been through. Göran Fritzon: It will certainly feel a little sad to go out on the Gyllene Tider’s last tour, but everything has an end. It is just so hard to believe that it has been 40 years since everything started. But I have my Farfisa organ close at hand in the music room, so I feel ready. 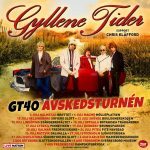 The secret of Gyllene Tider’s long career is perhaps that, like a classic vintage wine, the piece of art has succeeded in maturing in a way that has only reinforced the characteristic features. And maybe it is logical that the band has chosen to record their seventh and last studio album in France. Mats ”MP” Persson: This is the first time we go abroad and record, so it will be incredibly fun. Per has recorded fairly simple demos to leave all the doors open for the band to arrange the songs together. Because we all come in with different ideas, quite unexpected things can happen, such as when we tested reggae comp for a ukulele song – which became “Tuffa tider“. Per Gessle: We are like five brothers who do not hang out on a daily basis, but when we meet, something happens that one cannot really touch on. Personal chemistry? The 1 + 1 = 3-theory? I do not know, but we have always agreed on our love for pop music. With the summer tour it is thank you and farewell and I bow my head and smile. Thank you all. Previous PostPrevious Happy 60th, Per!